Santorini is the place to go in Greece! We can safely say that Santorini is one of the wonders of the world. Created after a gigantic volcanic explosion, it created what is known as “Caldera”. That’s enough of the geology lesson; the upshot for any discerning tourist is a stunning natural tour de force. Even if you have never been there, you have probably seen those iconic images of quintessential whitewashed houses perched on the hilltops looking out to the deep blue sea. 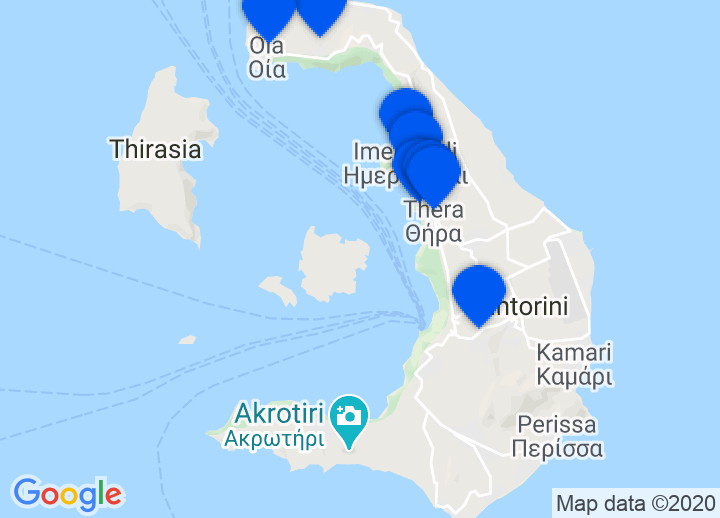 Choose from our unique selection of romantic hotels in Santorini by clicking on the map or list on the right. These will highlight our current selection of hotels, including boutique Santorini hotels, guest houses bed & breakfasts, amongst others. Whatever your taste, we’ll help you find that perfect getaway in stunning Santorini. There are two nice archaeological sites to have a look at. One is the Alt-Thera and the second one is the antique Akrotiri. Furthermore, you can visit the museum Fira with great exhibitions. If you want to see the volcanic landscape from a different perspective, you can go on a boat tour and enjoy the sunset! Also, scuba diving and sailing are very popular here. Lamb and especially fish is quite popular here so close to the sea! In addition, you should try the pséftikeftédes (fried vegetable balls) and fava (mashed flat peas). The regional Ouzo is delicious, but take care: the sweet drink doesn't feel like it contains alcohol. So it happens, that you have one over the eight!